Oxford Nanopore has demonstrated commercial machines that read DNA bases directly. The technology offers a way to make genome sequencing faster, cheaper, and potentially convenient enough to let doctors use sequencing as routinely as they order an MRI or a blood cell count, ushering in an era of personalized medicine. The company’s devices, which eliminate the need to amplify DNA or use expensive reagents, work by passing a ­single strand of DNA through a protein pore created in a membrane. An electric current flows through the pore; different DNA bases disrupt the current in different ways, letting the machine electronically read out the sequence. Rival sequencing technologies have gotten faster and cheaper in recent years as well. But most of them either use fluorescent reagents to identify bases or require chopping up the DNA molecule and amplifying the fragments. 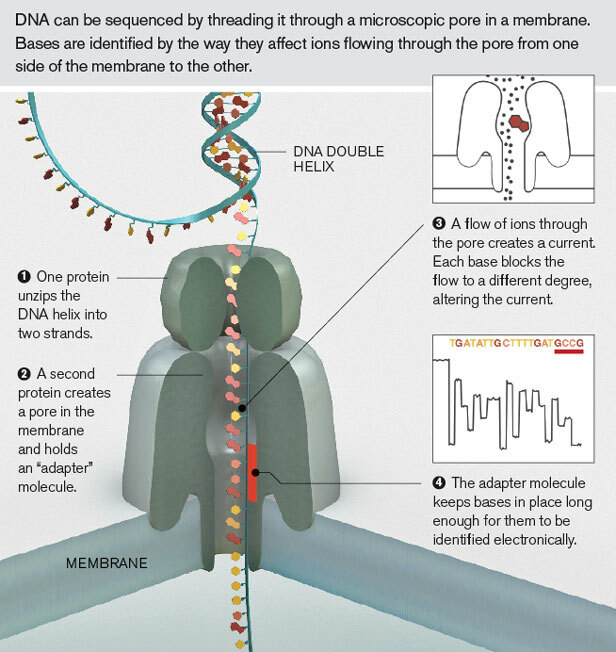 Nanopore’s technology is simpler, and it avoids errors that can creep in during these steps. The company reports reading a stretch of DNA roughly 48,000 bases long. “That’s by far the longest piece of DNA that anyone’s claimed to read,” says ­Jeffery Schloss, program director for technology development at the National Human Genome Research Institute. Oxford Nanopore’s new product line (which will begin shipping later this year) will include a miniaturized portable device, roughly the size of two decks of cards, that can plug directly into a computer’s USB port and is capable of sequencing small volumes of DNA. A larger desktop machine can handle larger volumes; clusters of these machines will be used for sequencing whole genomes. Although the company has not yet announced pricing for the desktop machine, the portable version could cost less than $900. This device will make it easier to read limited amounts of DNA in a host of settings, including remote clinics or food processing plants, where inspectors could monitor for contamination by dangerous strains of bacteria. can something like this be used as a 'dialysis' machine of sorts to filter out cancerous cells- what comes to mind specifically- bone marrow cancer cells? I suggest a portable toxin scanner. Fast identification of poison in the blood. Will this work? Don't put actual blood cells in the device. Use a micron filter and allow only stuff floating around in the plasma to get to the test device.